Personal growth products designed with you in mind. Want a great way to ensure Steph’s inspiring message lasts long after the conference is over? Make sure you scoop up a product for each audience member! It’s a low-cost, high-value take away that will having them remembering your event for years to come! Superb discounts available with bulk orders. If you want something more, something different, something better in your life but aren’t quite sure what it is – this book is for you. If you are tired of the lack of time, energy and motivation excuses and you know that the biggest obstacle getting in your way begins with Y and end with U – this book is for you. 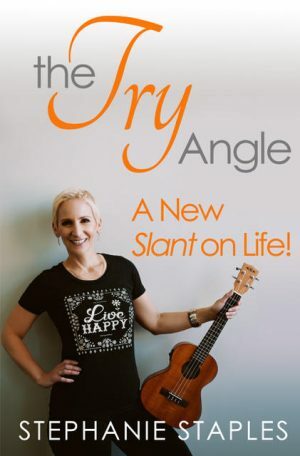 If you are ready for a little more fun, excitement and challenge in your life, buckle up and get ready to let The Try Angle enhance your life and the lives of those you love! Do not have another birthday without reading this book!! It’s the perfect birthday gift for you or someone you care about! If you would like it personalized (i.e. with a specific person’s name inscribed) please be sure to add that information on your order. W.E.S. is a perfect gift and when it’s personalized for your special someone and autographed by Steph, it’s extra special! Read more book reviews here and here. Best compliment ever… an audience member called to order another CD because when she and her boyfriend broke up he took her Your Life, Unlimited CD want won’t give it back. lol – True story! Journey with Steph as she talks you through 5 simple, but life changing principles, that you can apply today to begin creating a life of success and significance. Discover what thousands already have, a better life is just around the corner, it just takes a commitment from you to make small choices to create BIG life changes and it’s easy, with Stephanie’s help! If you have any issues with saying no, asking for help, dealing with guilt and other issues that are preventing you from living your best life, then read on! You will feel the energy in this live 2 disk CD set that focuses on you. Three hours of humour and insight await as Stephanie guides you through this easy to follow and fun session that will leave you with hope, inspiration and things you can do today to start growing your life. She asks one question of you, “Is there room for improvement in your life?” If so, journey inwards to journey upwards!